Music makers, movement builders and iconic artists of all kinds have contributed to the music we buy, know and love. DJ Afifa-Sounds of Life invites you to check out music stories on film. Composer, Afrobeat pioneer and human rights activist, Nigeria’s Fela Kuti (1938-1997) is often described as the African Bob Marley. In 1982, Fela discussed his life and work and performed some of his influential songs for this documentary by Stéphane Tchal Gadjieff and Jean-Jacques Flori. 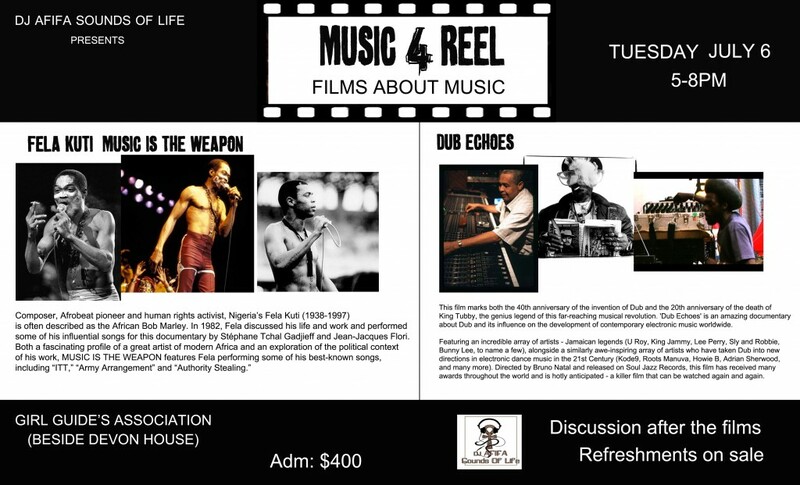 This film marks both the 40th anniversary of the invention of Dub and the 20th anniversary of the death of King Tubby, the genius legend of this far-reaching musical revolution. ‘Dub Echoes’ is an amazing documentary about Dub and its influence on the development of contemporary electronic music worldwide. Featuring an incredible array of artists – Jamaican legends (U Roy, King Jammy, Lee Perry, Sly and Robbie, Bunny Lee, to name a few), alongside a similarly awe-inspiring array of artists who have taken Dub into new directions in electronic dance music in the 21st Century (Kode 9, Roots Manuva, Howie B, Adrian Sherwood,and many more). Directed by Bruno Natal and released on Soul Jazz Records, this film has received many awards throughout the world and is hotly anticipated – a killer film that can be watched again and again.